Small group adventure specialist, Grand American Adventures, offers a number of In-Depth tours, a mesmerising mix of adventures that unearth North America’s natural wonders in springtime. North America in the spring offers many exceptional moments, as the diverse continent bursts to life with a new energy and vibrancy. 7 days from AU$4,449 / NZ$4,679 per person (exc flights) including six nights’ accommodation (five lodge nights and one hotel night) activities as detailed, six breakfasts and two dinners. Starting in March, the Washington Coast becomes the passageway for 20,000 Gray whales migrating back to the cooler waters of Alaska. Swimming just half a mile off the rugged beaches of the Pacific Coast, the whale migration is a true once-in-a lifetime experience. On Olympic and Vancouver Island In-Depth, visitors will see whales as well as other creatures such as sea lions and otters, before an afternoon kayaking excursion. 7 days from AU$4,639 / NZ$4,879 per person (exc flights) including six nights’ accommodation (two luxury yurt nights, two lake cabin nights and two hotel nights), activiies as detailed, six breakfasts, one lunch and two dinners. Wildlife viewing in Grand Teton National Park is at its peak during springtime, as the animals being to emerge from hibernation. The park opens on 1 May, when even some of the lakes can still be frozen. 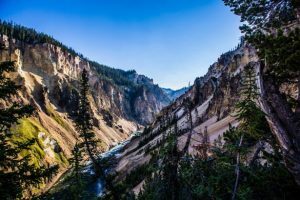 On Yellowstone and Teton In-Depth, guests will enjoy a half day scenic bike tour which not only takes in the breathtaking eastern slopes of the mountain range but also past wildlife such as bison, elks, rams, moose, bighorn sheep and wolves. 6 days from AU$4,959 / NZ$4,689 per person (exc flights), five nights’ accommodation (two nights luxurious glamping, two nights in a guest ranch and one night in a hotel) five dinners and two breakfasts are included. The ideal time to visit the red-rock wonderland of Arches National Park is in the spring. Travellers who join Canyon Country In-Depth will be able to hike through the 2,000 natural stone formations in the slightly cooler temperatures of between 26 – 32 degrees Celsius, compared to 38 degrees Celsius in the summer months. Three departures this spring: 28 April – 3 May, 26 May – 31 May and 16 June – 21 June. 6 days from AU$4,449 / NZ$4,679 per person (exc flights), five nights’ accommodation (three lodge nights, one resort night and one night in hotel), activities as detailed, five breakfasts and two dinners.